Ever since Coronado has been marketing high-quality and relatively inexpensive H-alpha filters and telescopes, more and more amateur solar observers dispose of their own H-alpha equipment. 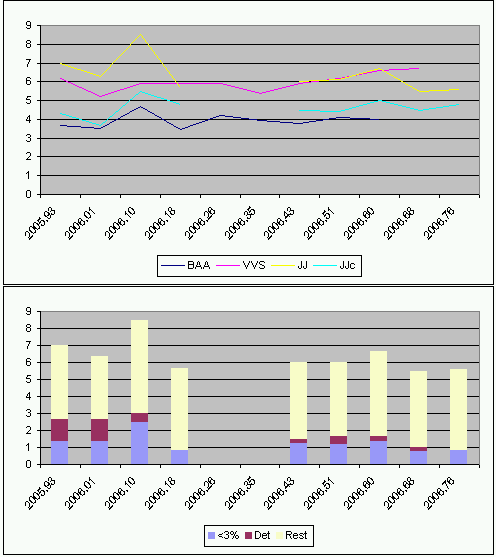 This trend is also noticeable within the Belgian Solar Section (Belgian Astronomical Association, VVS). Hence the need for a H-alpha observation program. On the one side, it would be good that everybody disposing of a H-alpha instrument can step into this program in a simple manner. On the other side, the program needs to be flexible enough to allow for an expansion. Moreover, because the observations should be comparable with other international solar sections, it is desirable that the same observation criteria are being used. Finally, it would be nice if contributions can be made to the professional solar program. From this, it seems appropriate to construct a program similar to that of white light observations. There, the basic consists in the determination of the Wolfnumber, and an advanced program exists for the determination of the hemispheric Wolfnumbers, the Becknumber, the Classification Value, positions of sunspotgroups and polar faculae numbers. Translated to H-alpha, the basic program could be the counting of the prominence hearths. 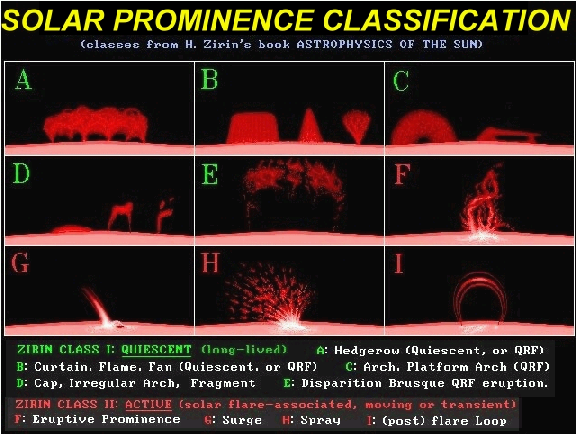 A more advanced program could contain the determination of the number of prominences per hemisphere or per zone (polar/main zone), the determination of the prominencenumber, the subdivision according to size, the classification according to Zirin, and latitude determination. Potentially, a professional contribution could consist in the determination of the optical classification and other features of solar flares, in support of X-ray observations. It is obvious that, just as for white light observations, some observers can further specialize. Amongst other are the imaging of the aforementioned solar phenomena via (highresolution) pictures or even videotapes, and studies of chromospheric faculae and filaments. For the moment, these topics will not be discussed here. Paragraphs underneath will deal with the observation of the chromospheric phenomena and related criteria. Before starting the observation, it is good to get an idea of the current atmospheric conditions. Quantification is done by using the seeing parameter Q. This is a measure for the atmospheric instability and is also used for visual observations of the photosphere. The scale is also employed by the SIDC, in steps of 0,5. In practice, the value of Q as deduced from white light observations is also applicable on H-alpha observations. If no observations of the photosphere are carried out, the same approach can be used by looking at the sharpness of the chromospheric network and the spicules (chromospheric edge). See table underneath. 5 Near-perfect image. The granulation is visible over the entire solar surface. There are no vibrations at the solar edge. The fine structure in the penumbra can be well observed. Near-perfect image. The details in the chromospheric network are well visible over the entire solar disk. There are no vibrations at the solar edge. Even the finest spicules are visible at the solar edge. The finestructure in filaments is well observable. 4 Very small groups and faculae are visible. The granulation is well visible. Very small details in the filaments and the chromospheric faculae are visible over the entire solar disk. The chromospheric network is well visible. The solar limb is moving slightly. 3 Also the smaller spots are visible. The shape of the penumbrae is well visible. The largest faculae can be seen as well. Chromospheric network is visible over the entire solar disk. Spicules, just as the smaller filaments are visible. The shape of the chromospheric facuale is well visible. The solar limb is vibrating a bit, but this vibration is hardly noticeable in the umbrae. 2 Only the biggest spots can be observed. Both umbrae as penumbrae are visible. Only the big filaments are observable. Hints of chromospheric network. The chromospheric faculae melt into the chromospheric background. The solar limb is moving strongly, and this movement is also visible in the umbrae of the sunspots. 1 Only the biggest spots are visible. Penumbrae are not visible, only the umbrae. Only the biggest and darkest filaments can be observed. Umbrae of the sunspots are not or hardly not visible. The entire image is waving. However, while observing prominces, also the transparency of the air should be taken into account. During periods of bad transparency (e.g. haze), the background in the eyepiece's field of view will turn red, making it very hard to observe small prominences or details in prominences. 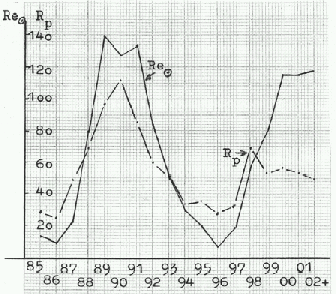 In 1968, B. Wedel  introduced a transparency scale W that need to be used while carrying out such observations. See table and figure underneath. 1 Celestial background is very dark, the prominences are very distinct. 2 Celestial background is dark, the prominences are distinct. 3 Celestial background slightly bright, but the prominences are still quite distinct. 4 Celestial background is bright, the prominences can only be seen with difficulty. In practice, Q usually has the value 3 and W about 2,5. Observations with Q < 2 and W = 4 are to be avoided. Observation with Q = 5 and W = 1 are exceptionnal, unless one observes from high mountain tops. The moments with the best seeing/transparency vary with location, the seasons and of course the day-to-day weather conditions. The orientation of the solar image is done the same way as in visual observations of the photosphere (). See attached figure. Put the sun as centrally as possible in the field of view. Choose an ocular allowing a full view of the sun. Let the scope immobile (turn of the motor drive when a motor-driven telescope is used). Because the sun has an apparent daily motion from the east to the west, she will not stay in the view's center, but will gradually move through the field of view. The line along which the sun has been moving, can now -in thoughts- be drawn over the center of the solar disk. If the position of visible sunspots is well known, it can be used as an additional reference. The leading solar edge (the edge which moved first out of view) is the western edge, the other is the eastern edge. Because of the rotations of sun and earth, as well as the movement of the earth around the sun, new filaments and prominences will first appear at the eastern solar limb, and will rotate off the solar disk about two weeks (half a solar rotation) later at the western solar limb. The east-westline divides the visible solar surface in 2 areas: the northern and southern hemisphere. To know which hemisphere is the southern, put the sun again as centrally in the field of view as possible. Move the (front of the) telescope slowly down. The part of the sun that stayed the longest in view, is the southern hemisphere. The part that moved out of view as first, is the northern hemisphere. The axis of rotation of the sun stands, just like that of the earth, oblique to the surface described by the rotation of the earth around the sun. 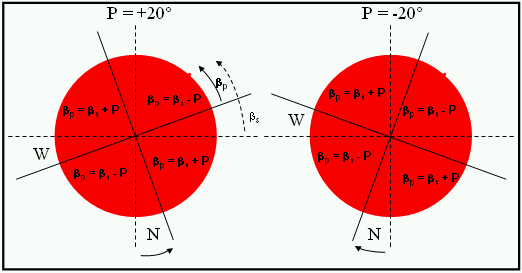 As a result, the real solar axis makes an angle with the apparent north-south-axis. Moreover, this angle varies throughout the year. This angle is called the P-angle, and varies between -27° and +27°. Theangle is counted positively from the north towards the east. Its value can be found in an astronomical almanac, on websites as BASS2000, or it can be calculated (see Calculation of solar paremeters for the necessary formulae). For the orientation of the solar image, an accuracy of 1° is amply sufficient. In the example, the correction was carried out for P = +20°. Due to the rotation of the earth, the positions of the east-westline and the north-south-axis vary thoughout the day. This is why for each observation, these 2 lines need to be determined everytime again. The use of a crosswire ocular increases the accuracy considerably. At all times, care has to be taken north and south are not reversed, especially if another telescope is used (e.g. for observing sunspots) where north and south are mirrored. Prominences, just like sunspots, group together. Therefore, the simplest observation program consists in counting the number of prominencegroups. These groups are also called hearths (from the German "Herde"). Prominences are taken together as soon as they are 5° or less in latitude from each other. If the distance between prominences is bigger, they can still be taken together provided there seems to exist a physical link. These "rules" were deduced from 2 drawings made by the German solar section Sonne ( and ). See figure underneath for examples. The British Astronomical Association seems to use this parameter in the determination of prominence activity (PMDF = Prominence Mean Daily Frequency), and the German Sonne uses this parameter as a base for its Prominencenumber Rp. In the figure, 6 prominence hearths are visible. The second prominence from the right is located 6° from the first, and 7° from the third prominence. Because it does not appear to have a physical link with its neighbours, it is considered as a separate prominence. In prominence four this link seems to be present. So, despite the fact that both ends are located 8° from each other, they are considered as 1 prominence. A more evident example can be found in prominence five, where the ends are located even further from each other, but the physical link is also much clearer (the parts of the prominence almost touch each other). In hearth six, the prominence distances are 4° and 3° respectively, hence they form one group. A prominence which is detached from the solar limb is considered a fullgrown prominence. Figure underneath provides an idea about what a subdivision in steps of 10° looks like. 5° is a really small distance (a quarter of a circle circumference divided by 18). It is assumed one can perform an accurate subdivision based on visual means only, though a crosswire is of course a great help. Counting prominencegroups can lead to interesting insights. From observations made by the British Astronomical Association (PMDF), it appears that maximum PMDF and its evolution during solar cycle maximum precedes the evolution of flare activity by 1 to 2 years. It may also be clear that during cycle minimum, there always are a few prominences visible. The rate cycle minimum / cycle maximum is approximately 1 for 30 for solar eruptions, 1 for 15 for the Wolfnumber R, and 1 for 3 for the PMDF! A possible expansion of the basic program consists in determining the prominencenumber Rp. 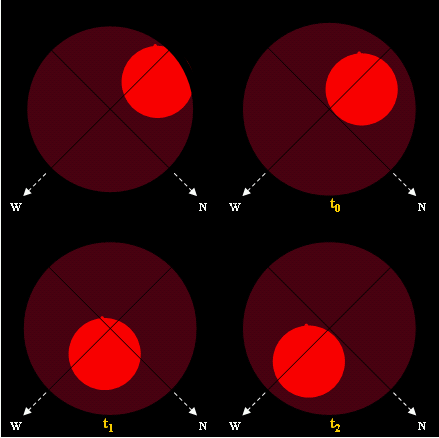 It is developed similary to the Wolfnumber R. For the determination of R, the number of sunspotgroups "g" and the number of individual spots is counted, for Rp the prominence hearths "H" and the individual structures "e" (from the German "einzel") are counted. Also the formulas are comparable. 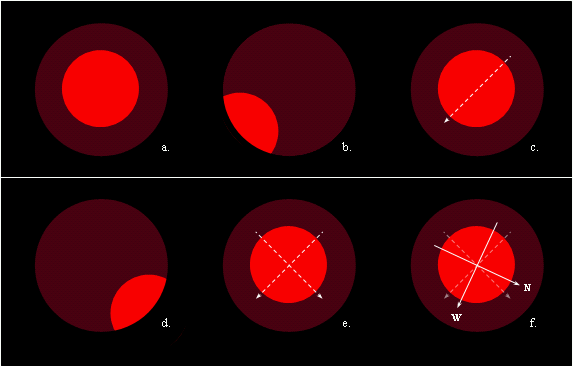 For the Wolfnumber it is R = 10.g + f, and for the prominencenumber Rp = 10.H + e.
Though no restrictions in size or lifetime were found in the literature, prominences should not be confused with spicules. These are 500 km wide, threadlike, up and down moving structures existing for about 10 minutes and reaching heights between 3.000 and 9.000 km (, , , clip (Movies; clip 7)). They are caused by oscillations of the solar surface (Bart De Pontieu, ). Because of their height (1% of the solar radius), it seems appropriate not to count any prominences smaller than 1% of the solar radius. In practice, this means that a small structure is considered a prominence if it stands out clearly and at least for 15 minutes above the solar limb. There does also not exist a restriction on the type of prominence. Prominences which are detached from the solar limb, are counted all the same. NO protrusions, twists, brightenings,... in a prominence are counted separately. In the example above there were 6 prominence hearths, with per hearth respectively 3, 1, 4, 2, 4 en 3 (= 17 in total) individual structures. The prominencenumber is thus Rp = 6.10 + 17 = 77. The prominencenumber Rp was developed by Völker in 1970. Strangely, the system seems only used by the German section Sonne itself. Graph underneath gives an idea of the evolution of Rp during the last two solar cycles (). Because the solar activity (Wolfnumber, solar eruptions) evolves differently per solar hemisphere, it seems straightforward to make a similar distinction also for the prominence hearths and Rp. The method to split the sun in a northern and southern hemisphere was already explained in the orientation of the solar image. The determination of the number of hearths and the prominencenumbers is done in the same way as described above. The numbers get an index "N" or "S" to indicate on which hemisphere they are applicable. In principle, it concerns HN, HS, RpN and RpS, for which of course H = HN + HS, and Rp = RpN + RpS. The prominences from the main zone mimic very well the activity of the Wolfnumber, but they appear about ten degrees further from the solar equator, and have a minimum of about one year prior to that of the Wolfnumber. The prominences from the polar zone appear about 2 years prior to the sunspotminimum, after which their activity increases and they move towards the poles (). Polar prominences reach a maximum about 2 years prior Rmax, then to disappear. The end of this period coincides with the magnetic polarity reversal at the solar poles during solar maximum (). There can exist important differences ("asymmetries") between the northern and southern solar hemispheric zones. Hence, a subdivision between polar and main zones seems necessary. Unfortunately, things get a bit more complicated here because there exist no unanimity concerning the border between the two zones. Sonne () uses 50° latitude as a border, while "The Astronomer" and BAA use 40°. The difference probably originates in the interpretation of "main zone". If one only considers sunspots, then the zone between +40° and -40° is to be considered as the main zone. This is because during the last 3 solar cycles only about 30 groups (of almost 11.000!) appeared at an higher latitude. On the other hand, sunspots do appear at latitudes above 40°, and faculae fields -the precursors of sunspotgroups- appear up to 55° (above that latitude polar faculae appear; ). In view of the mentioned physical connections, a subdivision at 50° seems reasonable. In case of doubt (e.g. 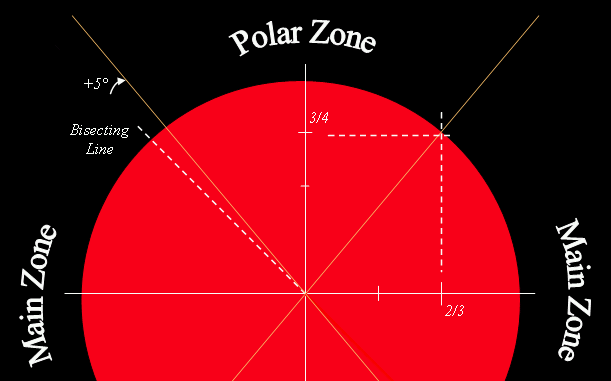 in case of a prominence stretching from +45° to +55°), the prominence can be considered as belonging to the polar zone. One determines the line between the real east-westline and the north-south-axis splitting the quadrant precisely in two. This so-called "bisecting line" makes an angle of 45° to the real east-westline. One only has to add 5° (towards the poles) to fix the two zones. 50° corresponds with about three-quarters of the solar radius on the north-south-axis, and two-thirds of the solar radius on the east-westline. The point of intersection at the solar limb indicates the latitude of 50°. Figures underneath show the subdivision per zone, and illustrate also the methods to visually define the the two zones. There exist 2 major classification schemes. The first one was introduced by Völker in 1969. 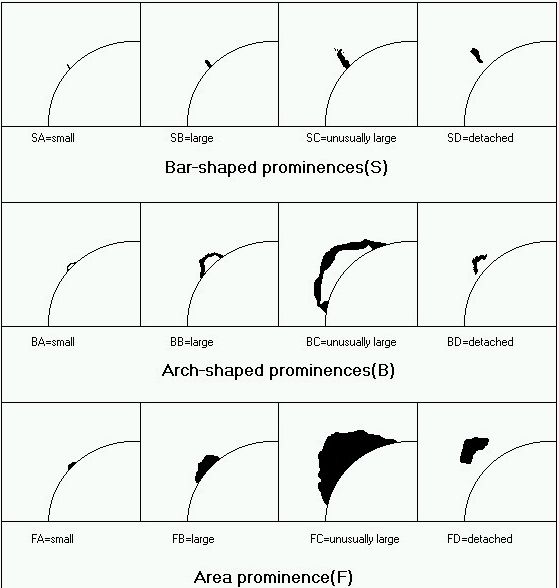 It makes a difference between the individual prominences based on the height (small, big or unusually big), the outlook (bar, arch or area) and if the structure is detached of the solar limb or not (). The overview is given in figure underneath and originates from the website of Anthony & Christopher Seal. The problem with this classification is that it needs to be applied on each individual structure within a prominencegroup. This is very timeconsuming, and one could question also the benefit (except for the height). It is also significant that nowhere reports can be found on this classification, not even in Sonne. The second scheme is based on the classifiction by Zirin (). Here, a distinction is being made between "quiescent" and "active" prominences, respectively called QRF en ARF. QRF can be subdivided in 5 types (A to E), and ARF in 4 types (F to I). It are especially the ARF and type E that matter, because here material can be ejected into space. In particular, when these particle clouds are ejected on the westside of the sun, they can have a significant geomagnetic effect. Figure underneath comes from the website of David Knisely. This classification has the advantage it only needs to be applied on the entire prominencegroup. Moreover, there is a real physical link with chromospheric activity. Unfortunately, also for this classification no reports are available. Prominences can also be subdivided according to their size. This can be done in 3 ways: according to the height reached, according to their area, and according to the length of the corresponding filaments. Figure underneath provides an idea on how high these prominences need to be in order to belong to one of the three mentioned categories. According to Zirin (), there is an eruption of every prominence (within 48 hours) if its height exceeds 50.000 km, this is 1,07 . Rzon. Professional astronomers (Catania) use the "Prominence Profile Area" (PPA) to track the prominence activity (). 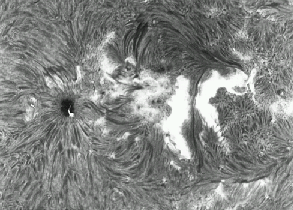 On a H-alpha picture, the solar limb is subdivided in 360 areas of 1°. 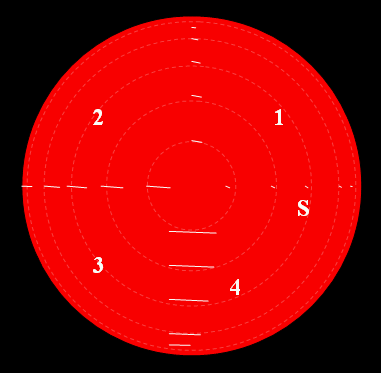 The number of arcseconds above each area of 1° wherein a prominence is present, is counted. Finally, all areas are taken together and summed. Of course, this is a very timeconsuming occupation. An alternative was developed by Völker (). The method is similar to the area-determination for faculae or sunspotgroups. 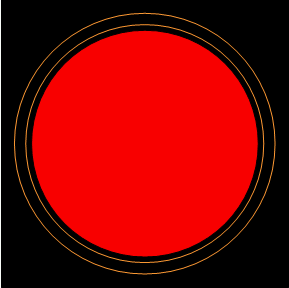 A transparent with mm-paper is put over the picture, and the number of mm2 that is completely filled with prominences is counted. The sum gives the area A. One has to pay attention that this determination is always done for the same solar diameter. Because this one changes in the course of a year (movement of the earth around the sun), a correction factor needs to be applied. The accuracy of the method (and also the work charge) increases with the size of the solar image, which needs to have a minimumdiameter of 15 cm. A final method is applied by "The Astronomer" () and consists in subdividing the solar limb in areas of 5°. 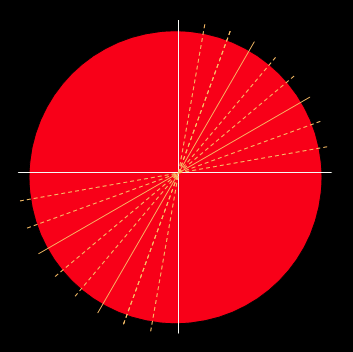 Each area in which a prominence is present, gets the value "1". Finally, all areas are summed. Not all prominences are eligible for the count. E.g. if an area (of 5°) is skipped by a large, archlike prominence, then this area is not counted. A prominence thus needs to be attached to the solar limb, and prominences should not belong to Völker's type "detached". Also short-lived, eruptive prominences should not be counted. On pure visual grounds, this method does not seem accurately applicable. Based on a picture (or using a detailed crosswire ocular), the counting can be quickly executed. A study () of quiescent prominences (QRF) has revealed there exists an excellent correlation between the prominencenumber Rp as determined by Sonne, and the Prominence Profile Area (PPA) as determined by Catania: 96%! According to , filaments having a length of more than 15° have a higher chance to produce a geomagnetic impact (if they explode) than smaller filaments. 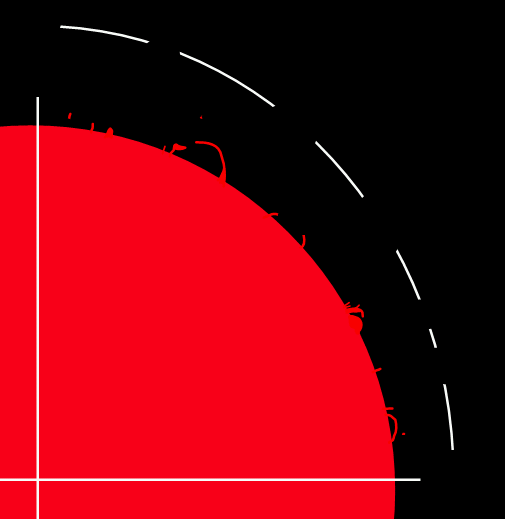 Observing prominences can not rpovide a clearcut answer on their true length, as may be clear from sketch underneath. There exists several programs measuring the length of quiescent filaments (QF; not related to sunspots), but they are all timeconsuming and actually require the use of pictures (). An alternative may be to estimate the length of each QF and subdivide in bigger or smaller than 15° length. While estimating their length, one needs to take into account the foreshortening: filaments at the solar limb are longer than they appear (just like the length of sunspotgroups). Figure underneath can be useful: It shows circles met radii of respectively 15°, 30°, 45°, 60° and 75°. The latitude of each prominence hearth can be determined by using a crosswire ocular or more accurate with a picture. Some possibilities are discussed in the Solar Astronomy Handbook (). Though all determinations are time-intensive, the results do give a detailed idea on the evolution in number and latitude of the prominences. Figure underneath gives the procentual number of prominences as a function of the latitude, for the years 1999 to 2002. 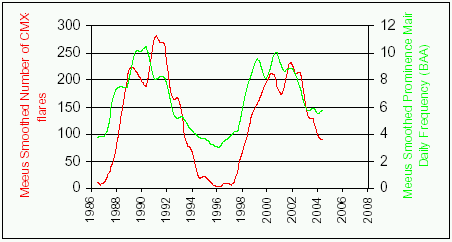 The physical events at the solar poles (see Per zone) become more clear here. Solar flares are transient brightenings of the chromosphere that may last for a few minutes to a few hours. The energy released in a solar flare may reach up to 1025 joule (about 10 billion atomic bombs of 250 kTon each!). Most flares are only visible by observing various spectral lines with a narrow band filter. However, the highest energy and brightest flares may by seen in unfiltered white light. These "white light flares" (WLF) however, are very rare, and can be expected to occur on average about 5 times per solar cycle. A broad band filter in the blue part of the spectrum (such as a Kodak Wratten #47) will substantially improve the chances of seeing a solar flare in continuum light, and at times of solar maximum, such a filter may allow the observation of a dozen flares or more per year. Typically the hydrogen-alpha spectral line, at a wavelength of 656,3 nanometres is used for solar flare patrol. A filter with a passband of 1/4 to 1/2 Ångstrom (0,025 - 0,05 nm) is commonly used for this application. A tunable filter is an asset to examine chromospheric motions associated with many flares, and the spectral width of a flare may also be used to indicate the brightness category of a flare if accurate photometry is not available. In general flares will occur close to an active region (sunspotgroup), but occasionally a flare may occur well away from an active region, but associated with a large dark filament. These are termed Hyder flares. There are two aspects to flare patrol: detection of a flare, followed by characterisation of the flare. Although a flare is defined as a transient brightening of the chromosphere, there are forms of chromospheric brightening which are not classed as flares. These are related to both the brightness and the area of the brightening, and it is these two characteristics which define when a flare has occurred. To be classified as a flare, the chromospheric brightening must exceed an area threshold and a brightness threshold. For H-alpha observations, the brightness threshold is 150% of the chromospheric background, and the area threshold is ten millionths of the visible solar hemisphere. A brightening which has less than 150% of chromospheric background (even though it may have more than 10 millionths area) is termed a plage fluctuation (a plage is a chromospheric faculae field). A small brightening which exceeds 150% of chromospheric background but less than 10 millionths hemispheric area is termed a point brightening. Secondary characteristics Active region or Hyder flare? Dark surge? Parallel (//) of confluent (Y)? Doppler shift? Loop system? Sympathetic (simultaneous) flares? Single- or multiple eruption centers? Moreton wave? Number of brilliant points? Visible in white light? There are six essential characteristics by which a flare is usually described. To these may be added several associated characteristics. These secondary features are usually added because of the information they potentially convey about possible geoeffective events that might be associated with the flare. Some of these may point toward associated coronal mass ejections; some may indicate high temperature flares which typically are associated with high energy particle emission (protons,...). The temporal behaviour of a flare is denoted by specifying a start time, a peak time and an end time.The start of the flare is defined as the time at which the flare first exceeded both the area and the brightness thresholds. The peak time of the flare is the time of maximum brightness of any region of the flare that exceeds at least 10 millionths hemispherical area. It is NOT the time at which the flare displays a maximum area (exceeding 150% background). This time in most flares, occurs after the time of peak brightness. The end time of the flare is the time when the area of the flare which exceeds 150% of chromospheric background intensity falls below 10 millionths. Make sure the used clock or watch indicates the correct time. Synchronisation can be done with the moment of the hourly news of the public broadcast, or even more accurate, with the atomic time. The location of a flare is usually specified by noting the heliographic coordinates of the geometric centre of the flaring areas (of which there may be several). The heliographic coordinates are the latitude and the central meridian distance of the flare centre. These are measured either with a Stonyhurst disk overlay or with computer assistance if the image is digital. Contrary to prominences, where one only needs to account for the P-angle of the sun (the angle of the central meridian of the sun with the north-south-axis as seen from Earth), also the B0 needs to be accounted for when determining the coordinates. Descriptively, the location of a flare may also be described in relation to a nearby prominent solar feature (eg sunspot, large filament, etc). Because the majority of the flares occurs in sunspotgroups, the NOAA-number of the group can be used as a reference in purely visual observations (see ARM, SOHO, MEES or SIDC). During large flares or flares with multiple eruption centra, an approximate location can be deduced by fixing the flare position together with the east-westline and north-south-axis on a drawing, and to treat the drawing as a picture. A crosswire ocular can be useful. An accuracy of 5° is already a success! In practice, an observer should not agonise over determination of the geometric centre of the flare. It is generally adequate to mentally draw a rectangular box around the flaring areas, and then to measure the coordinates of the centre of the box. The area of a flare is commonly measured in units of one millionth of the visible solar hemisphere. One millionth of the hemisphere is approximately 3,047 million square kilometres. In the past, the unit of heliocentric square degrees was also used. This is the square area which subtends, at the solar centre, an angle of one degree of arc on each side. One square degree so defined is equivalent to an area of 48,5 hemispheric millionths. An even more obscure unit is the solid angle subtended at the Earth by one square degree on the Sun at the centre of the solar disc. This solid angle is 16,73 square arcseconds. The determination of flare area is normally accomplished by counting the squares of a grid overlayed upon the image, or the digital analog thereof. However, this value must be corrected for foreshortening as the area in question moves closer to the limb. This presents a peculiar problem for the Sun, as flares also have a significant altitudinal (height) extent, and a limb flare may have its area grossly overestimated if a standard mathematical correction is used. Rv = r / R the fractional radius of the centre of the flare. 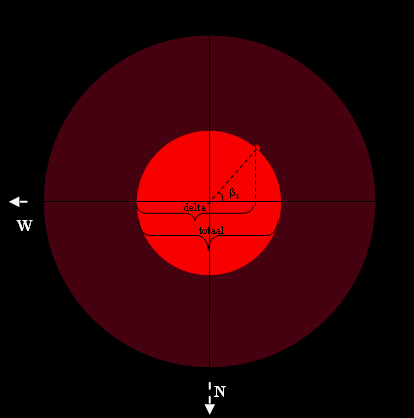 This may be measured on the disk in the same unit as the radius of the solar disk, because r represents the distance between the centre of the solar disk and the centre of the eruption, and R the radius of the disk. Note that the factor of 2 converts from disc area to hemispheric area (since disc area is p R2 and hemispheric area is 2p R2. The term under the radical is the standard limb correction, whereas the 0,2 . Rv term is the correction for non-zero altitude. This is in fact identical with the first expression, because the angle q is the angle subtended at the sun's centre by the great circle joining the centre of the disc and the measured point, and sine of this angle (q) equals r / R.
For visual observations, the length and width of the flare can be estimated and, after correction for foreshortening (see before), classified according to Ac ( °2 ). Also one could use the reference figure underneath, to make an estimate of the category. The width of the flare is 1°, the length is the minimum to belong to one of the categories 1, 2, 3 or 4. If the flare is smaller than the right flares, this means it is a subflare ("S"). Both the length and the width were corrected for foreshortening (calculated for 15°, 30°, 45°, 60° and 75°). The observer only has to make sure that the size of the used reference figure corresponds to the size of the solar disc as seen through the eyepiece, allowing for an equivalent comparison. Flare brightness is probably one of the least useful and least reproducible parameters of flare characterisation, depending strongly on the characteristics of the H-alpha filter employed. Because of this and other reasons, the brightness of a flare has only limited correlation with the total energy release during the flare phenomenon, and is thus of minor usefulness in trying to determine the resultant effects of the flare. When photometry is available (either photographic or digital),a flare may be classified into one of three categories ( F[faint], N[normal] or B[brilliant] ) according to the peak brightness of any area which exceeds 10 millionths hemispheric area, as specified in the table above and in % of the chromospheric background. Note that the background chromospheric intensity should be measured in the same general area of the flare to compensate for limb darkening effects. If photometry is not available, but the H-alpha filter can be tuned off-band, then the total bandwidth of the most brilliant parts of the flare may be used as a surrogate to try and estimate the brightness category. (Note that this might also be used as a surrogate detection threshold). Thus a faint flare must have a bandwidth of 0,8 Å (O,08 nm) over which at least 10 millionths hemispheric area can be clearly seen. This bandwidth may be asymmetrically displaced around the H-alpha line centre (e.g. from +0,2 tot -0,6 Å). Note that terrestrial atmospheric and local equipment changes (both optical, photographic and electronic) can change the background solar light levels, and photometry must be standardised to the current and local chromospheric background. It should also be noted that in photographic and electronic systems, a solar image adjusted for best visual display, will invariably have insufficient dynamic range (intensity overhead) to allow the photometric measurement of an unsaturated brilliant flare intensity. This point must be carefully considered in any flare patrol system. It may be necessary to maintain two image paths - a high light level path for visual observations, and a low level light path for flare brightness determination. This is comparable with the usage of a photographic and a visual filter for the observation of sunspots. Tables and graphic underneath give an idea of the number of H-alpha flares per area (importance) and per brightness class. Data are based on about 30.000 flares (data source: NGDC/NOAA) for which there exists both a classification in H-alpha as in X-ray (from January 1976 till December 2004). Table underneath shows that most flares correspond to a subflare. These subflares can become very bright though (SB!). The categories 3F, 4F and 4N have not been used for nearly 30 years, and there were only 9 4B's! In 60% of the cases, the flares are faint, and only 15% reaches brilliancy. Attached graphic shows the evolution of the different importance categories (1, 2, 3&4 together) for the period 1976 to 2004. The number of flares from the categories 3 and 4 is very low, and the 23rd solar cycle produced significantly less "big" flares than SC21 and SC22. Table underneath expresses the relation between the X-ray class of a flare and its optical classification in H-alpha. The numbers are promille (per 1000). C2 represents the average of the classes C1 to C3, C5 averages C4 to C6, and so on. X5 is the average of all X-flares. "0" means that since 1976, less than 14 such cases have occured, and "-" that such a case has not occured at all. Again, the large number of weak flares is noticeable, both in X-ray as in H-alpha. Interesting too is that the most powerful X-ray flares not necessarily are the brightest or the largest in H-alpha. There are many secondary characteristics that may be associated with a flare and different organisations choose to report varying subsets of these. Some parameters indicate high temperature flares, some indicate associated coronal mass ejections, and others have questionable correlations with any significant effects. Some of the potentially more useful are discussed below. Active region or Hyder flare? Most flares can be assigned to a particular active region or sunspot grouping. In these cases it is customary to assign the active region number (as designated by the Space Environment Center in Boulder , Colorado, USA) to that flare. A flare not capable of assignation to an active region is most probably a Hyder flare. Such a flare is usually associated with the disappearance of a large dark filament (well away from any active region), and this leads to the assumption that Hyder flares are associated with coronal mass ejections. Some would even add to this the production of energetic particles. While some Hyder flares are certainly associated with both these phenomenon, the empirical evidence does not support the assumption that all are. If a flare covers more than 20% of the umbra of the largest spot in the group, this is taken to be indicative of a high energy flare. Parallel (//-shaped) or confluent (Y-shaped) ribbon flare? Again, a high energy flare will typically display one or more ribbons of flare material parallel to (and often one each side of) the magnetic inversion or neutral line of the region, which separates different polarities of the line of sight component of the magnetic field. This neutral line is often delineated by a dark filament (group filament), or a recognisable filament channel. A loop prominence system (LPS) is definitely associated with higher temperature flares. It appears to be formed from material that has been ejected into the corona which subsequently condenses back down to form a bright top knot above the flaring region, and from there flows down to the chromosphere along the magnetic arches on each side of the top knot. An arcade or fan of such loops forms the prominence system. An LPS generally forms several minutes after flare peak time, and may persist for one or more hours. It is generally easy to recognise when seen in profile on the limb (BBSO (Movies; last but one clip)), but is much harder to recognise as a dark feature seen against the solar disc (my observation of the X1-flare of 30 July 05). Inexperienced observers may confuse material thrown out from a flare which then recurves back to the chromosphere, with an LPS, but the presence of the bright top knot, and the confirmation that material is flowing down on both sides of this knot is a definitive observation for an LPS. 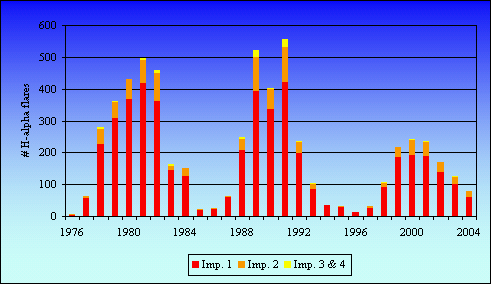 There is a high correlation of energetic solar particle events with an LPS. A flare may erupt from one or more centres. It has traditionally been thought that several eruptive centres may signify greater geoeffective correlations, but this is probably questionable. A faint or normal intensity flare may occasionally have embedded within it one or more points of area less than 10 hemispheric millionths whose brightness exceeds 350% of chromospheric background. The traditional significance of this is that the flare may be of higher energy than indicated by the intensity classification. Material may often be seen to be ejected from an energetically flaring region. The material may be seen as a dark surge or spray of material against the brighter disc, although if observed on the limb, it will be seen as bright against the cold sky (the same principle as prominences and filaments). Very rarely, very hot material may be observed as bright against the disc. If the speed of the material can be measured, it is sometimes found to exceed the gravitational escape velocity of the sun (617 km/sec), and presumably escapes into the outer corona. Frequently, part or all of the dark filament that lies over the neutral or inversion line of the region may be observed to disappear just before or during the progress of a flare. This may indicate an associated coronal mass ejection. If it can be measured, the Doppler shift through which the flare is observed may be recorded. The shift in both the blue and red wings should be indicated separately. As discussed before, this can be used as another indicator of the flare intensity. Most flares occurs in isolation, but every so often, two or more flares may start at nearly identical times, even though they lie far apart on the solar disc. This is thought to indicate a magnetic connection between the active regions concerned. The connection was thought to be via magnetic flux beneath the photosphere, but recent work has suggested a possible connection via coronal magnetic fields. Sometimes, a wave may propagate out from one flare (see Moreton wave), and appear to initiate another flare in an adjacent region through which it passes. A flare, like any explosive release, is undoubtedly accompanied, particularly at higher energies, by a shock wave. With the right conditions, this wave can be seen to spread out from the flaring area (like waves in a pond after a stone has been dropped) by changes in the intensity of the background chromosphere ()(Yohkoh science nugget). It may appear as an expanding circular ring (normally viewed on time lapse images). Often only part of the circle is apparent. The velocity of expansion is typically around 1.000 km/sec. The passage of the shockwave can be recognized by "winking" filaments (). The shockwave makes the filament vibrate, and these movements (doppler shifts) bring the filament temporarily outside the wavelength of the H-alpha line. The disturbance may be so severe that the filament becomes unstable, which in turn may result in an eruption. Basic document by John Kennewell. © Copyright IPS - Radio and Space Services. Reports of H-alpha observations need to satisfy the same requirements as the visual observations. The (monthly) report needs to be send as quickly as possible after the end of each month to the section leader (Franky Dubois), and has to contain essential elements like observing equipment , the address of the observer, and a short explanation of the symbols used (e.g. gN is the number of sunspotgroups on the northern solar hemisphere). It is best to make it immediately in English, so that the same report can be send to other international solar sections. For H-alpha observations, the aim is to transmit as much data as possible through electronic mail (e-mail) and in table-format (excel-file). This facilitates the processing work considerably. Any comments can be added in the cel itself ("comments") or underneath the table. Though it is desirable that everybody uses more or less the same format, this is possibly not feasible because everybody has his own program. This consists of the basic activity supplemented by observation programs of personal preference. Examples underneath give an idea how an observation report can be constructed. As can be seen, observing in H-alpha can lead to an entirely seperate observation discipline requiring a separate observation sheet. It is up to the observer to make this distinction. The division in solar hemisphere or in zones is not always evident based on purely visual observations. Help by using a crosswire(ocular) is very welcome. Discussion underneath applies in principle only to the Coronado PST (40 mm aperture, 400 mm focal distance, 12 mm Kelner-ocular), unless mentioned otherwise. Lichtenknecker sells 2 types of crosswire oculars: A 20 mm Kelner for 56, and a 10 mm Plössl for 193. The first ocular is reasonable in price, but the magnification is rather small (only 20x), the latter magnifies 40x but is expensive. As discussed further, a 20 mm ocular is sufficient for the division in zones. An alternative is offered by Optiek Van Grootven. For 15, one can buy a TAL-crosswire that can be screwed into the oculartube. However, there is a problem: the crosswire can only be seen sharply in oculars with a rather large focal distance (larger than 25 mm). ***This sharpness is independent of the focusing of the telescope! *** The conclusion is that the TAL doesn't work with the standard delivered 12 mm Kelner ocular. In fact, even the shortening of the oculartube would not entirely solve the problem, because the focus seems to be almost in the lens itself, meaning that at best only a hazy image of the crosswire will be obtained. The TAL did work with the Ganymedes Er. 25 mm ocular. The thickness of the wire and the low magnification result in the solar image not being well oriented. The 25 mm ocular with crosswire can be of use for telescopes with larger focal distances, like for example with a C8 for the hemispheric deterination of polar faculae observations. The ultimate solution consists in building oneself a crosswire ocular. One could make use of the etched glass crosswire plate that can be found in finderscopes or in microscopes. Fixed between 2 joints, the glass plate can be positioned close to the lens till a sharp image is obtained, with the crosswire centrally in the image. If necessary, the glass plate can be reversed, or an additional joint can be used untill wire sharpness is obtained. The whole of joints and the glass plated in between is kept in place by screwing the ocular tube as far as possible into the ocular. This explains immediately why this method can not be used with the standard delivered Kelner ocular: The tube screws on the outside of the ocular and can not fix anything. The method was successfully applied on a Celestron Ultima 19 mm ocular. The etched wire is very sharp and much finer than the TAL-crosswire. Whichever of the described methods is used, the ocular can only be used efficiently if the outside on the ocular contains a degree-scale. Several solutions exist. The most simple is to put a pencil mark in a highly noticeable color every 10° at the edge of the ocular that is normally resting on the ocular holder (zenit prism, Blocking filter) of the PST. 10° corresponds with the circumference of the ocular (= p . Ocular diameter) divided by 36. Once the marks are put on the ocular, they can be covered by transparent tape. This avoids the marks are smudged out during use of the ocular. Make a drawing of the sun in H-alpha as seen through the Kelner-ocular (or the ocular that is normally used for this kind of observations). Make sure a suffcient number of surface details is drawn. Choose a reference point on the sun. This can be the solar limb, a sunspot, or the end of a filament. Keep in mind the PST has a "sweet spot", meaning that a prominence may not be visible during the entire procedure. Put this reference point along one of the wires, and let the sun move through the field of view. The reference point will most probably move away from or towards the crosswire very quickly. By turning the ocular in the ocular holder, the position of the wire van be adjusted in such a way that the reference point moves parallel to the crosswire. This demands some practice, but experience comes quickly. The wire along which the reference point moves, is the apparent east-westline, and perpendicular on this line is the apparent north-south-axis. Put the centre of the solar disc at the junction of the crosswires. Correct for the P-angle by using the degree-scale at the outside of the ocular. As a reference point, the screw usually used for the fixing of the ocular, can be used. Make sure the ocular is immediately turned into the right direction (positive P-angles are turned from north via east), otherwise the entire procedure needs to be redone! The 2 crosswires now represent respectively the true east-westline and the true north-south-axis! Now keep the ocular in this position by screwing tight the aforementioned ocular screw. this will conserve the correct position of the crosswire. Place the centre of the solar disc again at the junction of the crosswires. The subdivision in northern and southern solar hemisphere, or in polar and main zone can now be done immediately at the ocular (if necessary by making a small sketch). Alternatively, the main axis can be traced onto the drawing, taking into account the surface details already put on this drawing. Because of the rotation of the earth, the procedure will need to be repeated for observations made at different times of the day: The movement of the sun through the field of view of the ocular varies accordingly! Especially for prominences located between latitudes 45° and 55°, it is not easy to subdivide them into polar or main zones based on purely visual grounds. To determine the latitude of these prominences, there exists an accurate (+/- 1°), but timeconsuming method based on the crosswire. Perform the steps b. through h. as explained above ("Use of the ocular"). At the end of the procedure, the northern and southern hemisphere need to be localized very well. The choosen reference point needs to move parallel to the crosswire for about 2 minutes. Spend the necessary time (10 minutes or more if necessary) to get as high an accuracy as possible. Do NOT correct for the P-angle: this will happen at a later moment. Make sure the prominence of which one wants to calculate the latitude, will move through the "sweet spot". Put the sun to the east of the apparent north-south-axis. The sun moves perpendicular towards this axis. At the moment the limb of the sun touches the crosswire, record the time (an accuracy of 1 second is sufficient). Call this time t0. At the moment the concerned prominence passes the apparent north-south-axis (the crosswire), record time again. Call this time t1. At the moment the solar limb touches the apparent north-south-axis for the last time, record time again. This is t2. For prominences located on the apparent western hemisphere , the formula results in latitudes larger than 90°. Take the negative value of this angle, and add 180°. Now perform the corrections for the P-angle. Make sure that if the east-westline is moving towards the prominence, the latitude of the prominence becomes smaller. See figure underneath for the necessary corrections. The true latitude bp of the prominence is then bs +/- P, with bp < 90°. On 18 August 2005, a prominence is located at the southeastern solar limb. After correction for the P-angle, this prominence appears to have a latitude around 50°. Time measurement needs to bring the decisive answer. bs = Arccos[(90 - 66)/(66)] = Arccos(0,3636) = 69°. Correction for the P-angle (+17°; see e.g. astronomical almanac) for the southeastern quadrant results in the true latitude for this prominence: bp = bs - P = 69° - 17° = 52°. The prominence belongs to the polar zone. It is interesting to see that comparison with images from the Solar Monitor reveals the latitude of the prominence is only 45°, but after verification with a Ha-picture of Meudon (via the Global Ha-network), it appears the latitude is indeed 52°. The grid as applied by the Solar monitor is not accurate and hence only indicative! Aside the seeing Q, during each Ha-observation also the transparency parameter W (Wedel) will be recorded. The basic program consists in the determination of the number of prominencegroups (H) and the prominence number Rp. The main purpose will be for longterm evolutions, allowing averaging over the observers. Only one observation per day per observer will be allowed (in principle the one with best seeing/transparency). To avoid any confusion with spicules, a prominence will need to stand out at least 1% above the solar edge and is more than 15 minutes visible. Single prominences standing over 5° apart, will be treated as separate groups, unless a physical link appears to be present (e.g. if the prominences are curved to each other). The advanced program consists in the determination of foregoing parameters H and Rp, but per solar hemisphere (north/south) and/or per zone (polar or main zone). Also the determination of the height of prominences as well as the observation of solar flares belong to this part of the program. 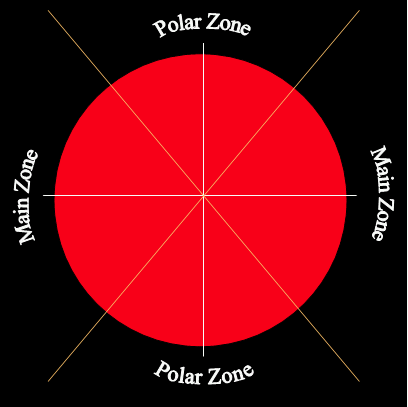 The transition of the main zone to the polar zone was fixed at 50° (in concert with the German solar section Sonne). Prominence groups extending from the main zone into the polar zone, will be considered as polar (e.g. from 45° to 51°). The specialist program contains photography, area determination, latitude and classification (Sonne, Zirin) of prominences. The observations will be send on a monthly base to the solar section leader before the 10th of each month. Questions, remarks, Ha-ALERTS (e.g. with a flare),... will be addressed on the VVS-forum (free subscription by sending an e-mail to "Majordomo@vvs.be" with message-body "subscribe wgzon"). E-mail of 5 November 2006 to BSO's solar section leader Franky Dubois. It was also published in the November 2006 Newsletter of the Solar Section. After the solar section meeting early October 2006, I have had some correspondance with Marlyn Smith (BAA) on this topic. Just as a reminder: While I was developping the H-alpha program last year, I did contact BAA (Mike Beales) but without any response. At that time, I simply used what I could find on their website. The BAA divides the solar disk in 5° bands and counts "1" hearth regardless the number of prominences that are in that area. In contrast, the BSO-observers count a prominence with a length of e.g. 7° as 1 hearth only if there is a physical connection. The BAA would count this always as 2 hearths. With their method, more prominences are counted compared to the BSO's. I think it's more complicated and -to me- requires a detailed crosswire. The BAA does not count eruptive or detached prominences. The prominences counted by BAA require an height of at least 3,3% above the solar limb, whereas for the BSO 1% is already sufficient. Note that the "1%-rule" was based on drawings in the Solar Astronomy Handbook (pp. 344) and Compendium of practical Astronomy Vol. 2 (pp. 36). Both are written by Peter Völker of the German solar section Sonne. The smallest prominences on these drawings are between 1 and 2% of the solar radius, hence the 1%-limit for our program. I want to mention this because from the website it looks as if I invented this limit, but actually there was a whole reasoning behind it. I decided to check my observations (Dec 05-Mar 06, Jun-Aug 06) for any influence from the last 2 differences (detached, 3%). The eruptive prominences during this period were of no significance, I counted 1 at most. Of course, the influence of these eruptive prominences can become bigger during solar maximum. I do wonder why one would omit such prominences from the prominencenumber H: why count a "quiet" prominence in the morning, and then not count it a few hours later when it is erupting? After all, the prominencenumber is a measure for chromospheric activity, isn't it? My initial average over the considered 7 months was 6,6, against 3,9 for the BAA. After my evaluation, my H-value dropped to 4,6: 1,4 was on the account of small prominences with heights between 1 and 3% of the solar radius, 0,6 came from the detached prominences. Excellent news is that the overall evolution of H did not change after the evaluation: same evolution, but on the average 2 units lower. As far as I'm concerned, this is an indication not to change anything to the way we are currently counting prominences. 4,6 is still a bit higher than 3,9. In my opinion, this is due to the fact that I observe only a few days per month, and thus there could exist a certain bias. Also, I do see some prominences of medium height, but very lightweak. Based on the above, I don't think we have to change something in the way we are counting prominences. Our monthly H-values will always be higher than those of the BAA, but now we know why this is, and also that we are in perfect agreement with the way Sonne is determining its prominencenumber.